You could win a $10,000 and more! This Promotion is offered only to legal residents of the fifty (50) United States and the District of Columbia who are at least eighteen (18) years old at the time of entry. Employees of Sponsor, Administrator, and any of their respective owners, parent companies, affiliates, directors, subsidiaries, franchisees, representatives, advertising, promotion and production agencies, agents (collectively, the “Promotion Entities”) and their immediate family members (i.e., spouse, parent, child, sibling, and the “steps” of each) and persons living in the same household of each are not eligible to participate in the Promotion. Void where prohibited or restricted by law. All federal, state and local laws apply. Instant Win Game Prizes: There will be eight hundred (800) instant win game prizes. (“Instant Win Game Prizes”). 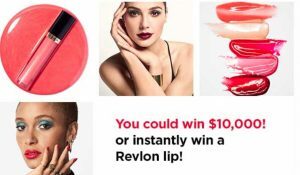 Each Instant Win Game Prize is a coupon for one (1) free Revlon Lip product. The ARV of each Instant Win Game Prize is $9.99. Total ARV of all Instant Win Game Prizes is $7,992. Sweepstakes Grand Prize (1): The Sweepstakes grand prize is a $10,000 check. There will be one (1) Grand Prize. The ARV of the Grand Prize is $10,000. Total ARV: The total ARV of all available prizes in the Promotion is $17,992.